Absurdly moving art « "TeresaBruceBooks"
While I was out hunting for ghosts of Byrne and Duncan in Santa Fe, I stumbled across an artist they both would have loved. Check him out. I met absurdity out West and now he’s a friend of mine. I stole that, actually, from the title of a book published by an artist we discovered at a flea market outside Santa Fe. What’s absurd is that Kelly Moore isn’t as well known as Thornton Dial or Howard Finster. 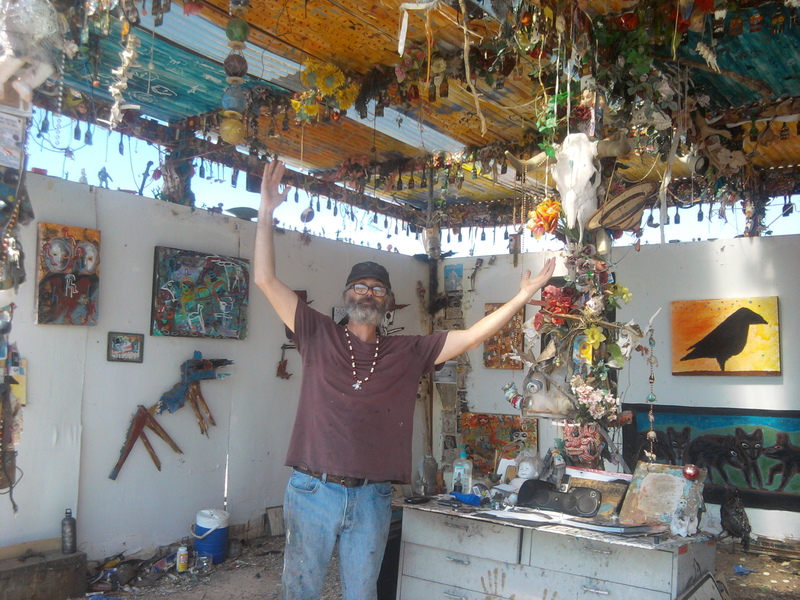 He’s so outside art that he actually makes art outside – almost year round, in his Tesuque Flea Market “stall.” He bungie-cords this three-sided gallery closed during the week, more to keep out the snow or desert summer heat than thieves.